Shares in major retailers have been hit after the severe weather stopped many shoppers from reaching the High Street on what is usually one of the busiest weekends of the year. Argos-owner Home Retail Group's shares fell 2.4%, while shares in Next, Marks and Spencer and Tesco also slipped. 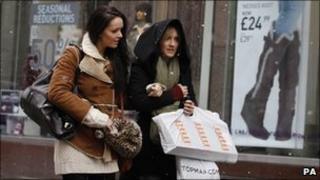 Experts are warning that the bad weather could hit the UK economy. Global Insight chief economist Howard Archer said there was now "a very real likelihood" that growth could slow. Global Insight currently forecasts GDP to grow by 0.5% in the fourth quarter of 2010, but Mr Archer said it could now come in lower than this. "The return of the snow and ice is a particularly serious body blow for retailers who would have been desperately hoping that the latest snow blast would not arrive until after the last Saturday before Christmas, especially as shopping was also disrupted in the first Saturday in December," he said. "The hit to retailers is compounded in that many are hoping for their sales to be lifted in the final days of 2010 by consumers looking to make purchases - particularly of big ticket items - ahead of January's Value Added Tax rise from 17.5% to 20.0%." Retail research group Synovate found that footfall across the UK on Saturday was down by nearly a quarter compared with the same time last year. Meanwhile, shares in British Airways were also down 1.9% after the airline cancelled all short-haul flights out of Heathrow. Consultants PricewaterhouseCoopers (PwC) have warned of damage to reputation and competitiveness for businesses that fail to prepare for disruption. "Preparation is everything," said PwC's Martin Caddick, "Proactive communication enhances reputation, while poor communication will lose business."